Accumulating stuff and more stuff: Are Millennials breaking the pattern? So will Millennials be the generation that breaks the constant cycle of accumulation? It also may be the case, as suggested in the Koncius piece, that Millennials are more likely to live in a digital mode, one less tied to accumulating material possessions. I’d like to think, or at least hope, that maybe they have wizened up to the fact that experiences, not possessions, tend to generate more individual happiness — something that many members of preceding generations have not necessarily understood. In any event, if this trend hardens into a generational lifestyle choice, then it may be a healthy development for society overall. Speaking as an inveterate collector attempting to downsize my own belongings, I know that we’d be better off shaking the accumulation habit. It does mean, however, that thrift shops may overflow with unwanted stuff from empty-nested McMansions. Those giant dining room tables may just have to be sawed down into kindling. Here’s a fun little discussion starter: When you check out a restaurant menu, shop at a store, consider job opportunities, or even assess social companions, are you a “maximizer” or a “satisficer”? A maximizer, according psychology professor Barry Schwartz (Swarthmore College), prefers to survey all possible choices in search of the very best option, even if it takes a lot of time to sift through the possibilities. A satisficer, by contrast, prefers to consider enough options to find one that works, and then selects it and moves on. 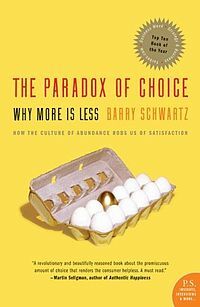 Schwartz discusses the maximizer vs. satisficer distinction in his book, The Paradox of Choice: Why More is Less (2004), in which he harnesses psychological data to show that an overabundance of choices can fuel anxieties, indecision, and unrealistically high expectations. This inquiry is especially relevant in cultures that place large premiums on having abundant consumer, vocational, and personal options. Okay, but you may be asking, who is happier, the maximizer or the satisficer? The answer is, at least in terms of statistical probability, the satisficer. The maximizer is more likely to be daunted by the array of options and to second guess a decision. The satisficer is more likely to find a choice that works and not worry about the rest. Ultimately, suggests Schwartz, the satisficer approach is a happiness maximizer! Of course, few people are embedded at either extreme, and for some, maximizer vs. satisficer traits may vary according to the situation. You may access Schwartz’s neat little 2004 Scientific American article that includes his 13-question survey and 7-point scale to help determine where you land on the spectrum. Me? I’m mostly a satisficer. I tend to assess my options and make my choices quickly. And if the result is pretty good, then I’m okay with it and rarely look back and wonder “what if.” Not always, but usually. I first learned about the maximizer vs. satisficer distinction in a free online course, “The Science of Happiness,” taught by leading experts in positive psychology. Here’s my write-up about the course, including a link to the course registration information. The American Psychological Association has dubbed May 20 as Mental Health Blog Day “to educate the public about mental health, decrease stigma about mental illness, and discuss strategies for making lasting lifestyle and behavior changes that promote overall health and wellness.” In response, I thought I’d collect a handful of articles from the past year that may resonate with this overall theme. For a free subscription to Minding the Workplace, go to “Follow this blog” at the top right of the home page, and enter your e-mail address. Last fall I took a free online course, “The Science of Happiness,” facilitated and taught by leading authorities on positive psychology. I thought it would be enlightening and useful not only for work, but also for my life in general. I was not disappointed. It was an excellent course, well-conceived and clearly organized, with plenty of compelling content. I can recommend it enthusiastically to my readers. After a successful rollout last fall, the course is now offered on a year-round basis through EdX. You may access it here. Created by UC Berkeley’s Greater Good Science Center, the course will zero in on a fundamental finding from positive psychology: that happiness is inextricably linked to having strong social connections and contributing to something bigger than yourself—the greater good. Students will learn about the cross-disciplinary research supporting this view, spanning the fields of psychology, neuroscience, evolutionary biology, and beyond. What’s more, “The Science of Happiness” will offer students practical strategies for nurturing their own happiness. Research suggests that up to 40 percent of happiness depends on our habits and activities. So students will learn many different research-tested practices that foster social and emotional well-being—and the course will help them track their happiness along the way. The lead instructors for the course are Drs. Dacher Keltner and Emiliana Simon-Thomas of the Greater Good Science Center at UC-Berkeley, and they appear frequently in short videos introducing segments of the course, summarizing material, and sharing their own expertise. They are very smart, down-to-earth, and likable. Short video lectures and articles from other experts are featured throughout the course. Quiz questions at the end of each unit, midterm and final exams, and optional homework exercises help to measure and expand your learning. Although this is a non-credit course, it requires a fair amount of time each week, roughly 4-6 hours by my estimation. Although I finished the course and earned a certificate of completion, there were a few parts that I passed through rather quickly and am now returning to in order to get a more complete set of notes. However, it’s not necessary to complete the course in order to get something out of it; you can cherry pick your favorite units and leave it at that. For a modest fee, you can earn a Verified Certificate that may enhance your resume. Health care professionals may be able to earn continuing education credits. 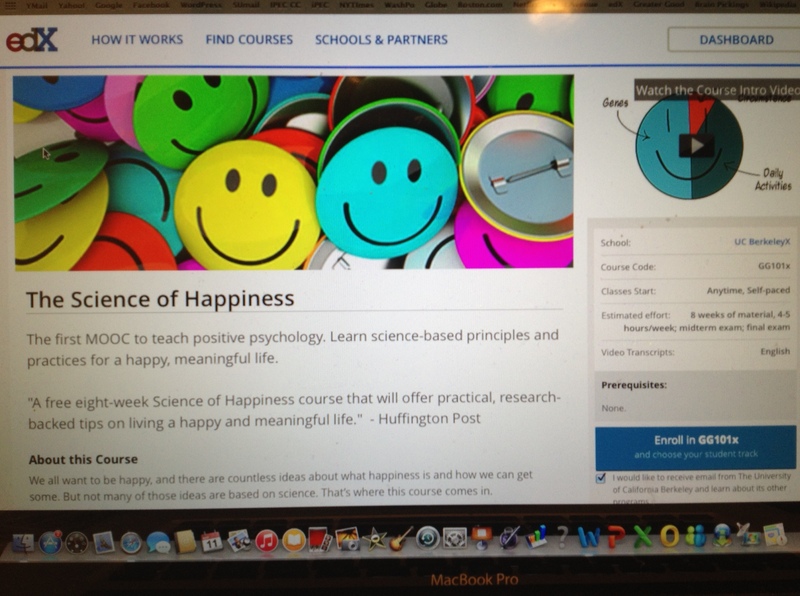 A note for skeptics: I would not have finished this course if it was all about superficial happy talk. This course gives us some tools for dealing with life’s ups and downs, and it is grounded in research and science. I found it to be a smart and insightful offering. I wrote about a lesson I learned from the course in “Not-so-random acts of kindness for the non-saintly among us” (2015). He offers extended explanations for each of these points. I recommend the full article to anyone who wants to understand more of the nuances between relentlessly negative and relentlessly positive attitudes at work. While endorsing the idea that people can change their “mood and outlook through conscious effort,” Kjerulf takes on the notion “that you can always change your thinking in any situation, and that external circumstances don’t matter,” adding that “telling someone in a really rough life situation that they should think more positively is incredibly condescending and a terrible way to trivialize their pain.” He also does a nice job of distinguishing positive thinking from the field of positive psychology, the latter of which he generally endorses. papau. Deeply engaged, absorbed, engrossed; united, all together. Papau may be an elusive place; let’s face it, even the best of jobs have their grunt work. But the state of being deeply engaged, absorbed, engrossed; united, all together is something to which we all should aspire. And if our current daily tasks don’t offer this possibility, then we should strive to find things that do. It’s not just about ridding ourselves of the bad stuff; it’s also about envisioning something better. Thanks to Wikipedia for the great photo of a Maui sunrise at the Haleakala crater. 1. What if we applied the Golden Rule at work? (October 2010) — Did you know this “rule” has its roots in many faith traditions? 2. Can communal responses to tough times lead us to better lives? (October 2010) — Hopeful, humane, and creative thinking for difficult times. 3. Seth Godin: Seven keys to personal reinvention (September 2010) — Better than a New Year’s resolution.